The Columbia-class ballistic missile submarine program (SSBN-826) is coming down in cost and staying on schedule despite an early challenge, program officials said last week. After moving into engineering and manufacturing development (EMD) at the beginning of 2017 and beginning early construction prototyping activities, the SSBN program is proving it can leverage all the tools at its disposal to take cost and schedule out of the Navy’s top acquisition priority. 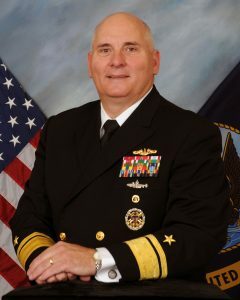 The program was giving a $8-billion affordability cap, and when the Milestone B decision was made in January to move into EMD, the program was sitting at about $7.3 billion for the average procurement unit cost (APUC) across all 12 planned submarines, Program Executive Officer for Submarines Rear Adm. Michael Jabaley said at the Naval Submarine League’s annual conference. “Through innovative legislative authority and contracting techniques, we’ve already reduced cost by $80 million per hull, to bring APUC down to $7.21 (billion),” Jabaley said. Congress gave the program several new authorities to help with the Columbia class. Lawmakers allowed for continuous production of the missile tubes – a shared venture with the British Navy – so that manufacturing rates can stay level rather than the ups and downs that would come along with buying them in ship sets based on U.S. and U.K. sub acquisition timelines. Lawmakers also created a National Sea-Based Deterrence Fund and created opportunities for the Navy to save on common components shared between the Columbia program, the Virginia-class attack submarine and the Gerald R. Ford-class aircraft carrier. Jabaley said early work is taking place now at General Dynamics Electric Boat to prototype the “quad pack” construction method that will be used to build these large submarines. “This process is critical to the ability to build the ship in seven years, 84 months,” he said. 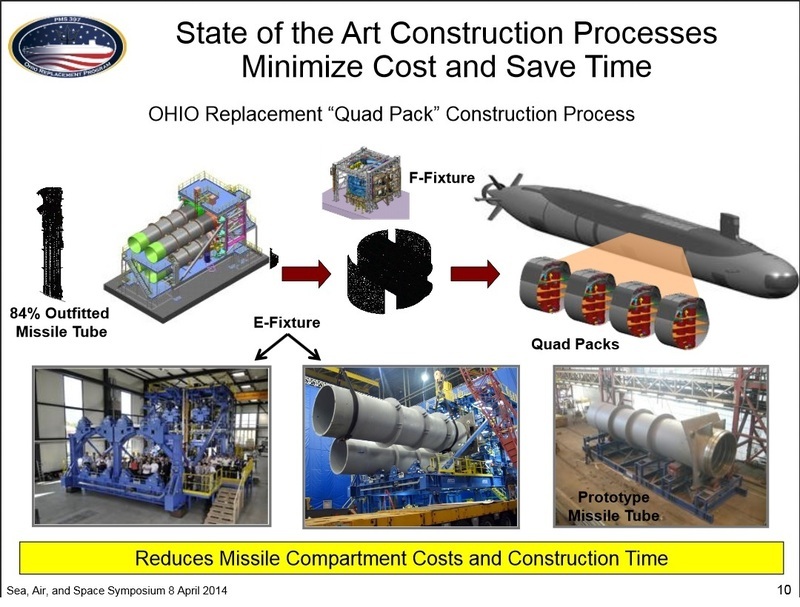 “We’re on a very aggressive design and construction schedule with no margin; we can’t shift the schedule any further right,” Naval Reactors Director Adm. James Caldwell said at the conference, adding that testing should span until early 2019, when procurement is set to begin. Caldwell said the program is still on track despite a challenge earlier this year with the electric drive’s motor – not one intended for use on a submarine, but the pre-production model meant to support testing. “We have faced a challenge in the manufacturing of the pre-production full-sized motor that we’re going to use for testing. It was not a technology challenge; it was a manufacturing challenge. We addressed the cause on that and modified (the schedule) – we built the schedule, by the way, to have a good amount of margin in it, meaning months that we could use if we had a challenge that we found,” he told USNI News during a question and answer session. Caldwell told USNI News after his speech that Naval Reactors is responsible for the life-of-ship fuel and the electric drive, both of which are still on track to deliver ahead of need at the shipyards. He said the Navy and Congress are supporting the program with adequate funding but added that the submarine community needs to keep being vocal about what it needs to keep the Columbia program on track. “It’s a complex project, it’s a very big submarine – it’s two and a half times the size of a Virginia-class submarine, and we’re going to build it in the same timeframe as the first Virginia class that we built – so the challenge is big,” he said.